The walls are painted, the dust has been cleared and the NEW Cloister Shoppe is open for business! 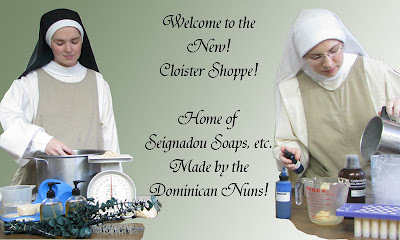 We hope you will enjoy the many new features of our little monastery store. We are crossing our fingers that we got all the little quirks figured out! Thank you again for your support. There will be some new things in the future! God bless you and reward you! Salve Regina: Sung by the Order of Preachers Around the World!